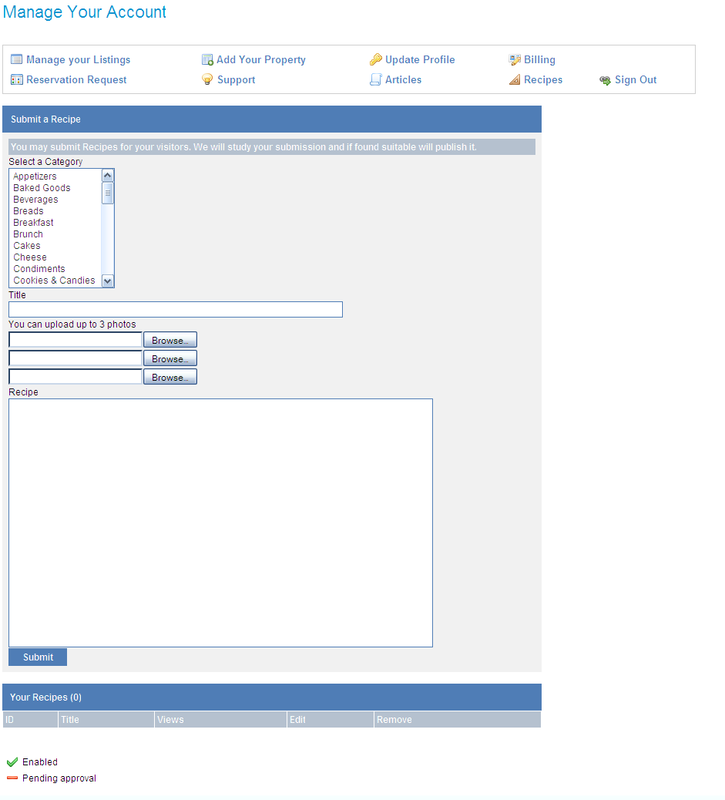 Detailed Property Description - Include a detailed description of your property. 10 Free Photos - Post 10 photos of your property. Room Descriptions - List details and photos of all your rooms. Room Rates - List and update your room rates at any time. Gift Certificates - Sell your gift certificates on your listing. Email Contact form - Travelers can contact you by email to ask questions about your property. Reservation Request - Travelers can contact you by submitting a reservation request. Listing Stats - access your listing views, clicks, inquiries, & leads. Link to Your Website - Your listing will have a link directly to your website. Maps Inclusion - An online map to your property will be displayed in your listing. Weather Inclusion - An updated weather feed will be displayed in your listing. Search Engine Index - Your property listing will be indexed by all major search engines. Cooking Recipes - Include unlimited cooking recipes. Article Submission - Post articles you've written and drive traffic to your property listing and website. Nationwide Exposure - Your listing is viewed by thousands of travelers for a fraction of the cost of other advertising. 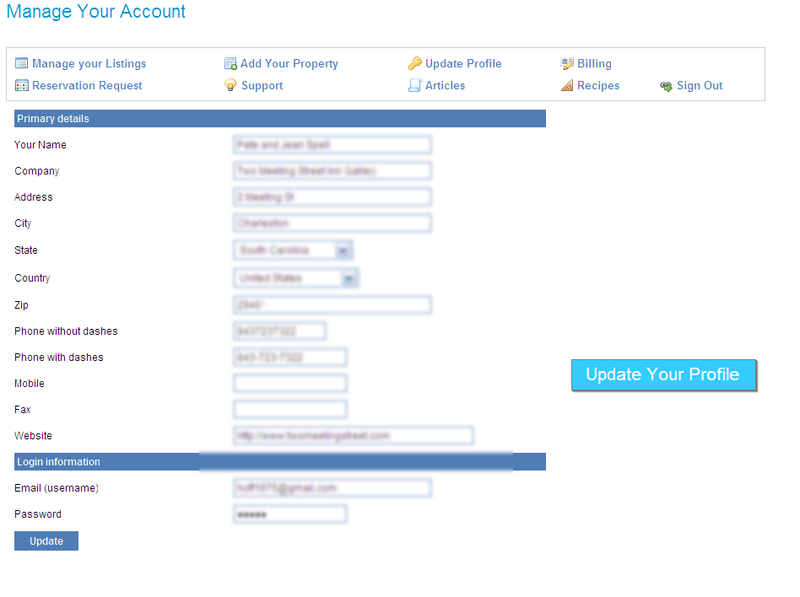 24/7 Account Management - Easy tools to update and manage your property listing. Featured Home Page Ad - Featured members have their property rotated daily on our home page. Featured Search Page - Featured members have their property rotated on all search pages. 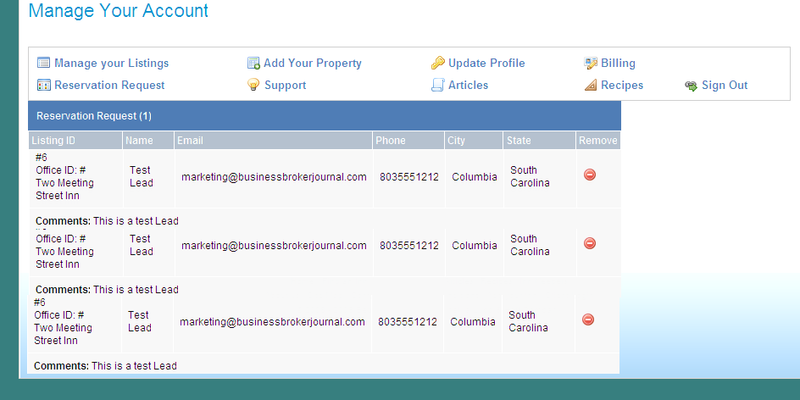 Featured on Top of Search Results - Featured members have their properties show up on the top of all search results. Unlimited Property Listings - Own multiple properties, post unlimited listings. Here�s how the Bed & Breakfast Journal provides successful marketing solutions to property owners. We advertise on thousands of online directories, search engines, blogs and more. What are the main benefits of advertising on The Bed and Breakfast Journal? Low annual cost of $99.95: Our annual rate is a third of the cost of average membership rates for the most basic plans of competing directories. More features included: Our standard membership offers more features than the highest membership plans available on other sites. The largest directories are not the only solution because your property is lost with all the competition: It is important to advertise on the large directories because they have a large subscriber base; however the high amount of other property advertisers on these sites will make your property frequently go unnoticed. Relying only on the most well known directories is a huge mistake in marketing your property: It is more effective for you to diversify your advertising budget across several quality property directories so that you gain marketing exposure from each of them. Relevant link to your website to increase link popularity on search engines: Link popularity is the total number of websites or web pages linking to your website. The more relevant the website is to your industry the more effective the link has on your search engine ranking. Improving the link popularity of your website is key to improving your search engine ranking. Direct website link: Receive more visitors to your website and property by directing visitors from the Bed and Breakfast Journal directly to your site through your property link. Increased internet marketing: The more your property is viewed and available for review the greater your chance is of receiving increased reservations and the ability to maximize your earnings. Experience in online marketing: The Bed and Breakfast Journal is a division of Lupo Hoff Technologies and we have several years of experience in creating successful online directories. What is a featured membership? All of our standard membership benefits plus your property listings will display at the top of search results for your city, state, and rotate on our home page. How do I edit my property listing or manage my account? Log into your client management site and you can simply edit and update your listing description, prices, photos, submit a article, submit a recipe, view reservation request, and update your contact or billing preference. Can I view reservation questions? Yes. Your account management site allows you to see how many travelers have viewed your property listing and if anyone has contacted you with a reservation question. You will be automatically emailed with any reservation question. How do I post an article or recipe? Log into your client management site and you can post any article or recipe by clicking on �Submit Article� or �Submit Recipe�. Once your article or recipe is approved normally within 48 hours, it will be displayed on our home page and article page. You can edit or remove your article or recipe at any time. Your article will display your name and website as the author. Submitting Articles on the Bed and Breakfast Journal website is an excellent way to educate travelers about your property and drive more traffic to your website. Yes. You may cancel your membership at any time. Can I view your client management site? Yes. Click on any link below to view features of our Client Management Site. The Bed and Breakfast Journal launched the development of our website and subscriber base in July 2008 and began accepting property advertisers in July 2009. Add Your Inn Today Online: It only takes 2 minutes. Registration is so easy all you have to do is enter your property details using our simple to use online form. Fill out the registration form and choose a username and password to gain access to your client management site. 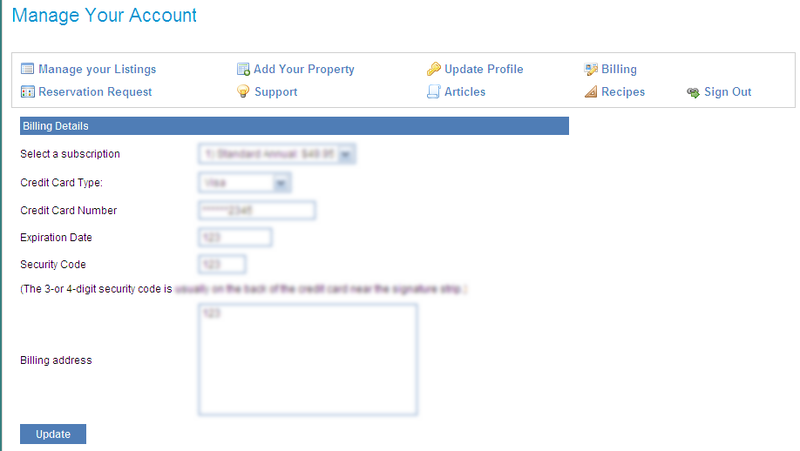 Once you submit your registration, your account will immediately be activated and you can enter your property details. 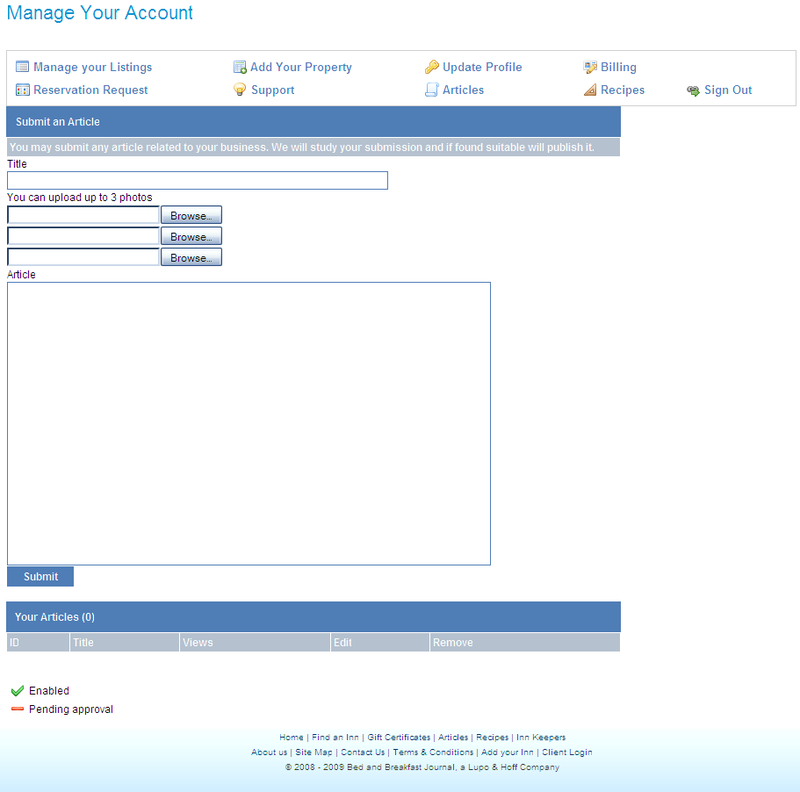 Create your Property Listing: Log-In to your client management site using your username and password. Click on �Add New Property� and simply fill out the form with your property description, prices, and photos. You�re finished! Yes, it�s that easy. If you have any problems or questions please give us a call at 908-968-0922.